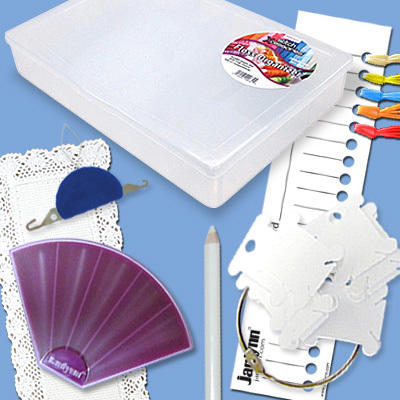 Our Stitchers Value Pack is filled with handy tools for the needlecrafter at an amazing price! Our Pack includes; 1 Needle Case, 1, 17 Compartment Floss Organizer, 1 Needle Threader, 28 Plastic Bobbins with Ring, 1, 18ct Aida Bookmark, Transfer Pencil and 3 Floss Organizer Cards. All of these items are high quality and very useful for all aspects of Needlecrafs! Great value and great savings!